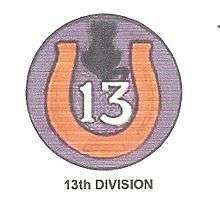 Shoulder Sleeve Insignia of the 13th Division, featuring a horseshoe and a black cat, in keeping with the organization's tongue in cheek nickname, "Lucky 13th". The "square" 13th Division's complement of four regiments included the 1st, 44th, 75th, and 76th Infantry Regiments. In August 1918, two infantry brigades were formed. The 25th Infantry Brigade comprised the 1st and 75th Infantry Regiments and the 38th Machine-Gun Battalion; the 26th Infantry Brigade comprised the 44th and 76th Infantry Regiments and the 39th Machine-Gun Battalion. The 44th Infantry Regiment had formed earlier at Vancouver Barracks, Washington. After the Armistice of November 11, 1918 there was no need for the 13th Division, and it was inactivated and demobilized in 1919. ↑ 13th Division Staff (1919). 13th Division: Official History, 1918-1919 (PDF). Fort Lewis, WA: 13th Division, U.S. Army. p. 7.